OS X is awesome and that’s why we (neckbeard-less?) developers love it. Of course not everything is perfect, and one area of contention is the menu bar. There tends to be a never-ending supply of icons that fill it up and destroy its usefulness due to information overload. There’s even tools that help you organize your menu bar, but I think that’s just fighting symptoms and not a permanent solution. Anyway, these tools are not for me, and I’ve decided to put my menu bar on a diet. Dropbox—so I see if stuff is synced. I use the black & white icon. gfxCardStatus—so I see which graphics card my MacBook Pro uses, and to force it into using discrete graphics if browsers start to have graphical glitches, which is unfortunately quite often. Little Snitch—hovering over the icon shows Little Snitch’s nifty network monitor. iStat Menus 4 CPU monitor—helpful during development and has shortcuts to launch Activity Monitor and other tools. Time Machine—I like to see that it’s doing stuff when I have my backup drive connected at the office. Keyboard & Character Viewer—I use OS X’s Character Viewer tool ⓐⓛⓛ ⓣⓗⓔ ⓣⓘⓜⓔ. Bluetooth—useful at the office for my external keyboard, mouse and trackpad. iStat Menus 4 battery—more info than OS X’s default icon. Volume control—I use the keyboard to change the volume, but option-clicking the icon allows you to quickly set input and output devices. iStat Menus 4 clock—I like the “fuzzy clock” and the dark grey calendar icon. 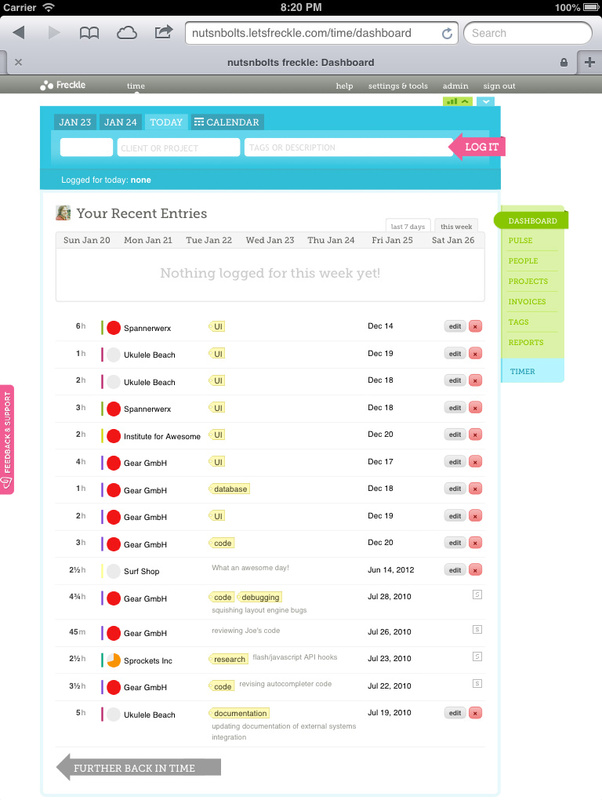 This December, our Time Tracking app Freckle will turn five. I’ve learned a lot about running a SaaS over these years, from making the right business decisions to choosing the technology to go with them. The single most important thing you have to do as a business is make money. You need to pay your bills and put food on the table. At the same time you don’t want to compromise what you’ve set out for, in our case building the best time tracking tool there is and making it fun and awesome. It follows that you need to have the most time available to actually talk to customers, refine the product and add awesome features—without losing the focus on what you’ve set out for. In other words, you want to minimize time spend on things that other people probably know more about, including obvious things like taxes and accounting, but also keeping a SaaS up and running. Postmark sends our transactional email. No need for us to run our own mail server plus we know we can rely on deliverability. A must if your app sends mail. DocRaptor, a hosted version of PrinceXML, for converting HTML to PDFs. We literally implemented PDF downloads for invoices in one hour of coding with it (that includes writing tests and all). logentries.com keeps a tab on our logfiles, and provides instant search in case we encounter an issue. Much faster to quickly locate logs as you can view logs of the same time period across servers combined into one view. Dome9 provides a SaaS firewall solution so we don’t have to mess with iptables or other weird things manually. They have an iPhone app to on-demand open up ports we need to administrate our servers. Webmon and Pingdom allows us to monitor world-wide service availability and response time, as well as see if our DNS resolves globally. Pingdom also provides our status website without further configuration necessary (it took 5 minutes to set up). Dead Man’s Snitch emails you when periodical tasks (cronjobs) aren’t running. PagerDuty collects alerts from various services and gives us a central place from where to distribute alerts by text message and emails. This saves time by not having to configure all monitoring services separately. Tinfoil and Trustwave do security scans of our infrastructure, and tell us when it’s time to install security updates. KISSmetrics for metrics and event tracking and Customer.io for sending out on-boarding emails, as well as emails about features. If there’s someone that can do it for you (probably better than you can) for a price that makes sense, then you’d be stupid to build it yourself (and by the way, this list is not exhaustive, there’s even more services we use). There’s a thriving ecosystem of apps and services that help you running your SaaS—make good use of it! There now is an abundance of devices with some sort of high-density display, from MacBook Pros to iPads, from Windows Surface tablets to all kinds of mobile phones. All of these devices have one thing in common: In web browsers (that support the high-density screen correctly) one CSS pixel is not equal to a physical screen pixel. In terms of CSS, to specifically target this group of devices, unfortunately there’s no easy way to say “apply this set of rules to all devices where physical pixels are not equal to CSS pixels”. Instead you have to fight through a whole forest of media query rules. This is tested on all browsers I could get ahold of, on real Retina and non-retina displays, and should be future-proof as well. We use this specific query in production on Freckle Time Tracking (Sorry, marketing site is not retinafied yet! )—and it works well! I’d love to hear corrections and suggestions about this, please use the gist. *Before you ask, I suppose it supports Opera as well, but I don’t test on Opera. It’s a long story. Want to make your websites all ready for the smorgasbord of screen resolutions and densities? Fear not—my latest ebook Retinafy your web sites & apps now will guide you through the jungle! Learn how to deal with all this in 30 minutes reading, and have your site all shiny by tomorrow! Retinafy your web sites & web apps: 30% off for Cyber Monday! Black Friday Sale: Learn to be a HTML5 Mobile Pro! Instead of the stress of fighting for the deals at your local shopping center, why not lean back in your pyjamas and learn all about HTML5 Mobile pro development from the comfort of your home? And even better, if you buy HTML5 Mobile Pro Desktop Edition until midnight on Friday, November 22, you get 55% off the regular price. Just use coupon code BLACKFRIDAY! For photos, use high-resolution JPGs with low quality settings. Let the browser scale the image down on normal screens. Bonus: no increase in file size! Create a proper Favicon. This will make your websites icon not look ugly in bookmarks and browser toolbars, and will only take a few minutes. If you’re willing to spend a little more time, I’d highly recommend to look into replacing bitmapped images with CSS gradients and effects, and/or with SVG-based images. It’s more work, but it will pay off in faster loading times, less complex HTML and more flexibility to change designs and adapt them to new requirements (for example, if you decide to implement responsive design). The devil is of course in the details—but there’s no need to research all this yourself (which likely takes weeks! 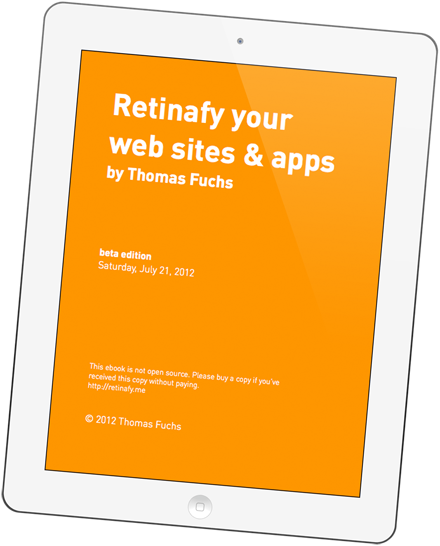 ), just grab a copy of my ebook about Retinafying your web sites and apps! The display resolution of a screen describes the total amount of pixels available in each dimension—for example, the original iPhone has a resolution of 320×480 and a 2012 27-inch iMac clocks in at 2560×1440. Some people use terms like “VGA” resolution for some of the more popular resolutions (VGA is 640×480). Don’t bother trying to memorize all of them, as there are too many screen sizes these days. Pixel density, on the other hand, is how many pixels fit into a fixed amount a space, and is most often given as pixels per inch (ppi) or dots per inch (dpi). These units are the same and can be used interchangeably. For example, the original iPhone sports 163 ppi, while the 27-inch iMac has a density of 109 ppi. It follows that the iMac compared to the old iPhone has a much higher resolution but a much lower pixel density. So what is “Retina” exactly? Glad that you ask. First off, “Retina” is a marketing term Apple uses to say something is “high-density”, but for the sake of simplicity I’m liberally applying this term to anything that’s not a “normal” density, or more specifically any display where, by default, one CSS pixel is larger than one physical screen pixel. A screen that is, in Apple-speak, called a “Retina” screen has twice the pixel density of a “normal” screen with the same physical size. That’s four times as many pixels. There’s also some in-between densities on some Android phones, for example the Google Nexus One phone has a 1.5× higher pixel density than a “normal” phone. This is equal to slightly more than 2× as many pixels. In Android-lingo, that’s called a “high DPI” phone.